There is an old saying that applies to many aspects of life: “Garbage in, garbage out.” That means if you put a lot of garbage foods into your body, your body’s output of athletic energy will be lacking. It is important to eat balanced meals that include enough fruits and vegetables, protein and carbohydrates. It’s also important to avoid processed sugar, such as in candy or soft drinks. All true basketball players want to perform at their best every time they hit the court. To make sure you can do that, eat right and drink plenty of water to stay hydrated and healthy, especially in the hot summer months. 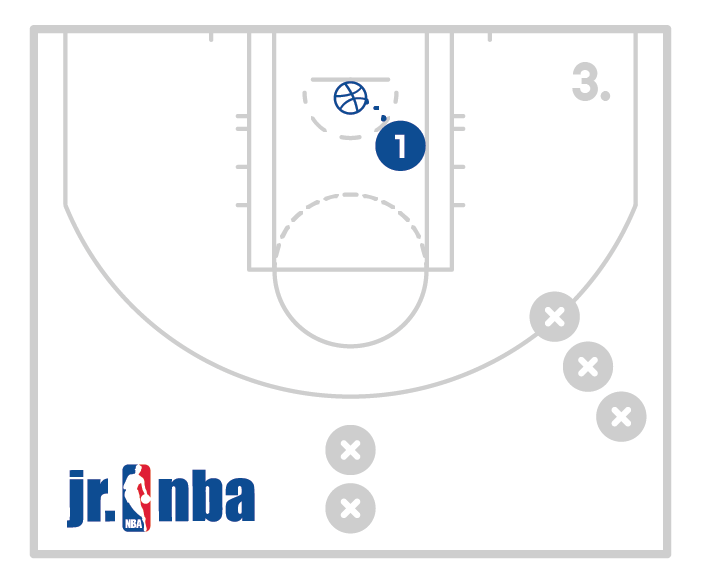 Have all the players get a ball (or share) and find a space on the court. The players will begin taking small dribbles in front of their right foot and then continue taking small quick dribbles as they dribble between their legs to the left hand. The player will continue the process with the left hand coming around the left leg and then through the legs to the right. Continue this process for the allotted time and then switch directions. Players should be in a stance with their legs wide and their chest up. The players will then wrap the ball around one leg for 10 seconds and then change directions for 10 seconds. The players will then do the same activity on the other leg which completes one set. Get comfortable with the ball, warm-up the fingers and hands, and develop the ability to control the ball. Be sure to have the players keep their chest and eyes up. Help the players feel confident moving the ball as if it is an extension of themself. Push the players to wrap the ball fast in order to challenge their control. The players will start in a good stance with their knees bent and eyes up and take 3 dribbles with their right hand. 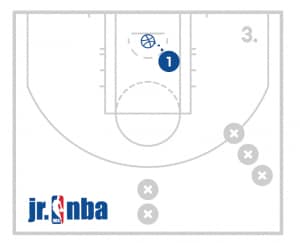 Next the players will complete 3 crossover dribbles. 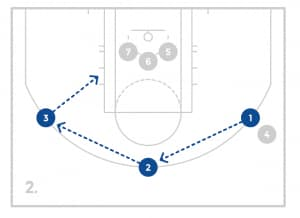 Then the players will execute 3 dribbles with their left hand. 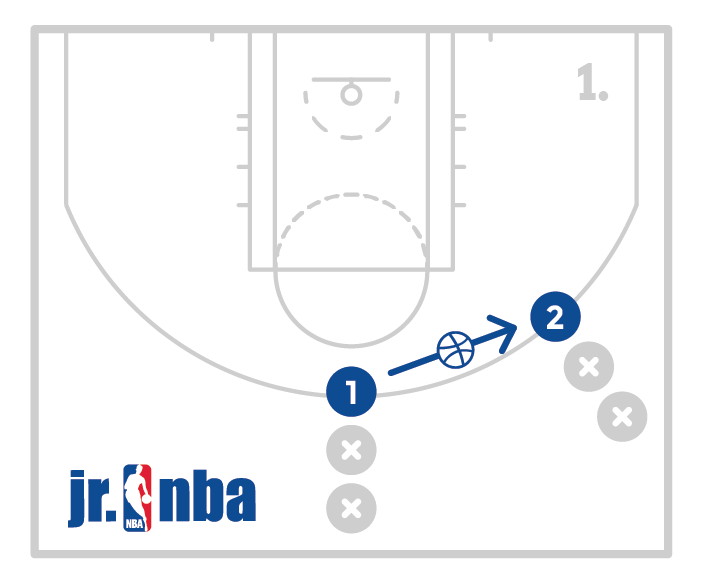 The players will go back to 3 crossover dribbles and then 3 right handed dribbles and continue the process for the allotted amount of time. 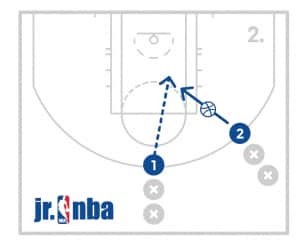 This drill will work on low controlled dribbles with both hands as well as the crossover. 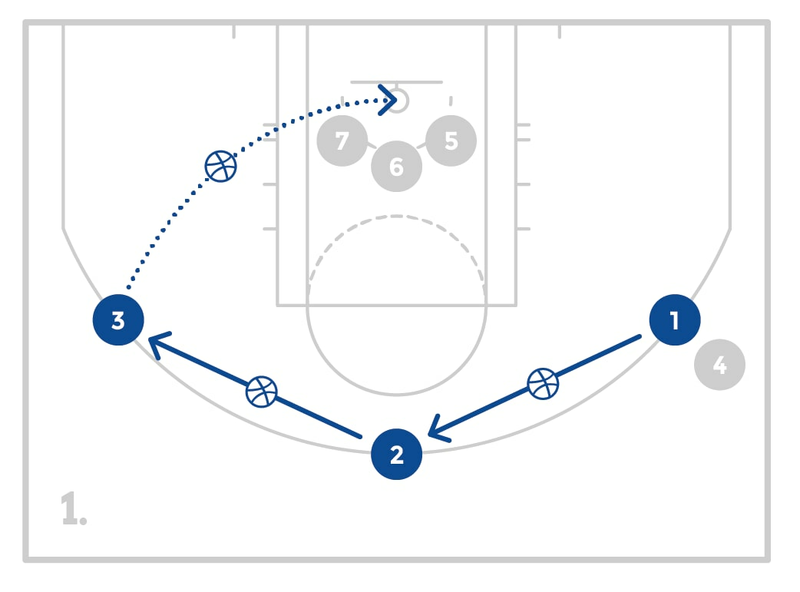 Have the players start in a line at the lane line facing the sideline with the basket to their left. Have the players push out off their right foot and land on the left foot as they catch the ball, turn to square up and shoot. The player should rebound and give the ball back to coach as the next player goes. Work on a good big push, being balanced and turning and squaring up for a perfect shot. Have the players partner up and get a ball. 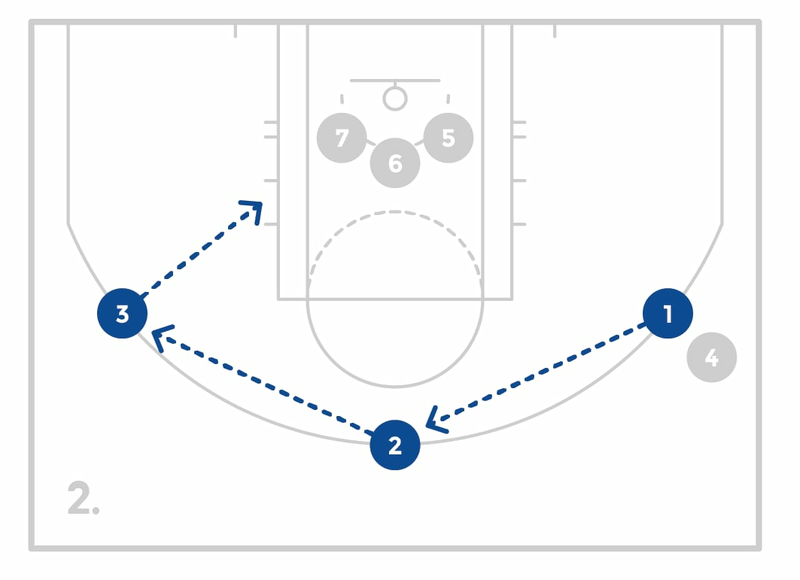 The players will place the ball on the floor and take four steps away from the ball. 1 player will be offense and 1 player will be defense facing the offensive player with their back to the ball. When coach yells “shot” the defensive player will make contact and box out the offensive player as the offensive player tries to go touch the ball. The goal is to have all defensive players to hold the box out preventing the offensive player for touching the ball for 3 seconds. Switch roles and repeat the process. Start with a player on the wing. 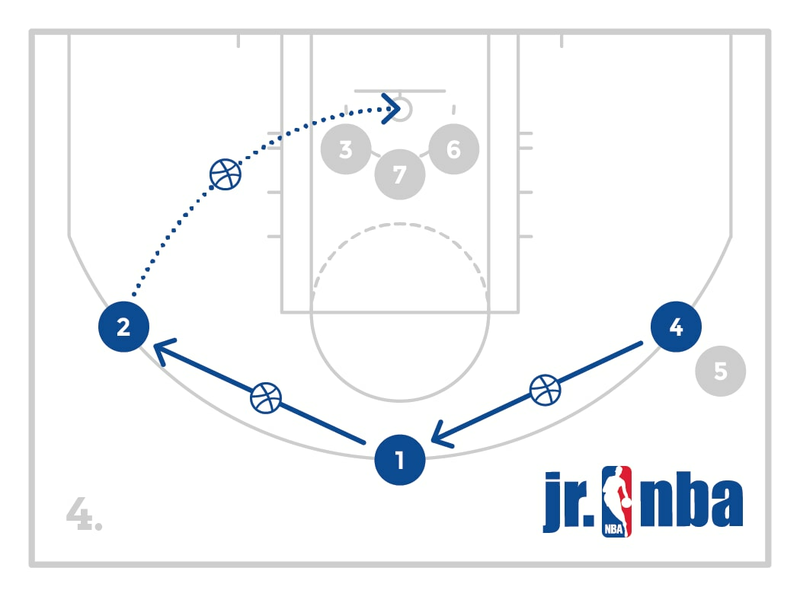 Place another player at the top of the key and another player on the opposite wing, and the remaining players in a line under the basket as rebounders. 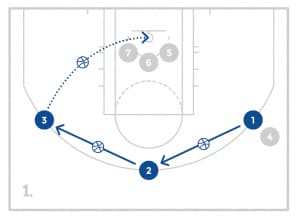 The player at the front of the line on the wing will start with the ball in a triple threat stance and when the coach says “Reverse the ball!” the player will pass the ball to the top of the key. The player at the top of the key will quickly catch and pass the ball to the other wing so that the ball has been “reversed” to the other side. When the player on the opposite wing catches the ball, they will shoot the ball and then go to the rebounding line. The player that gets the rebound will make an outlet pass to the wing where the ball started and then go to the end of that line. The player who passed from wing will move to the top, the player from the top will move to the shooting wing, and the wing that started the drill will move to the top. 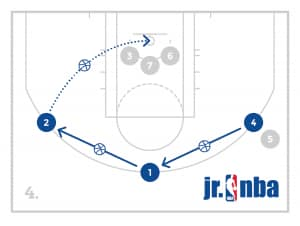 Have a group at another basket doing the same thing and compete to 8 makes and then change directions and then change to a 1 dribble pull up for 2 games. To ensure balance, have the players land in the jump stop position and count to 3 before jogging to the next spot. 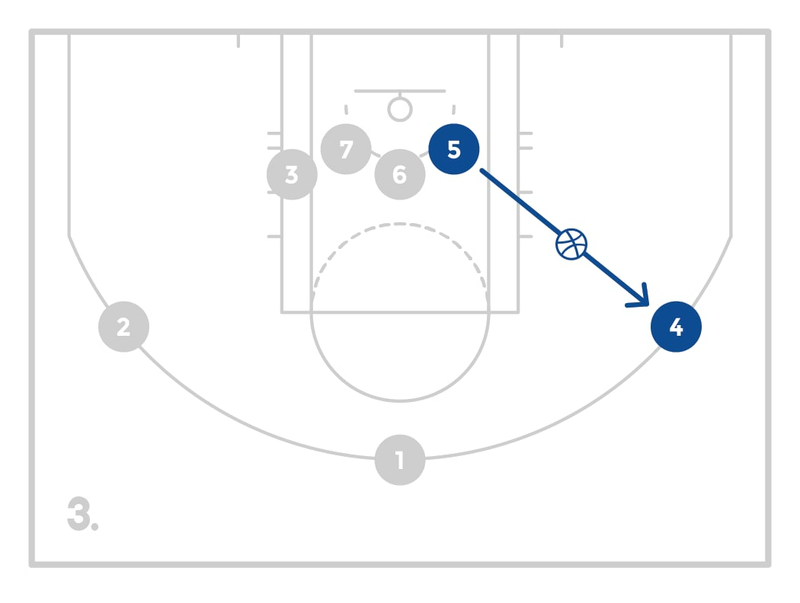 Place four spread out lines on the baseline. Have the first player in each line start with their back to the court in a good defensive stance. The players will take too slides at an angle backwards while keep their chest, shoulders and hips facing forward. After two slides they will change directions and push back at the opposite angle and continue this all the way down the court. The next player can begin once the player in front of them gets to half court. Players should try to keep their chest, shoulders and hips facing forward and never turn to open up. Every push should be off of their back foot, not a step and pull. Divide the players into teams and have them play games of 5 on 5 with no dribbles. If a player dribbles, it is a turnover and the other team gets the ball. Play for the allotted amount of time and then communicate observations about the play. Encourage the players to keep moving and cutting to get opportunities to score. Remind the defense that with no dribbles, they can pressure the ball and deny passes!